“ Nihil est in intellectu quod non prius in sensu. ^ 1.0 1.1 1.2 1.3 1.4 1.5 Philip Schaff, The New Schaff-Herzog Encyclopedia of Religious Knowledge (Grand Rapids: Baker Book House, 1953), vol. XI, p. 422. ^ 3.0 3.1 3.2 3.3 3.4 Schaff, p. 423. 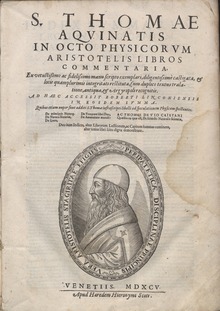 ^ 4.0 4.1 "Aquinas, Thomas", Encyclopædia Britannica (1911), pg. 250. ^ Will Durant, The Age of Faith (Simon and Schuster, 1950), p. 978. 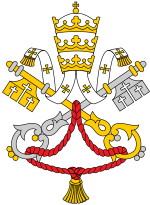 ^ Summa Theologica, First Part of the Second Part, Question 109. Retrieved 26 August 2006. ^ R. C. Sproul, Renewing Your Mind (Baker Books: Grand Rapids, Michigan, 1998), p. 33. ^ Louis Pojman, Ethics (Belmont, California|Belmont, California: Wadsworth Publishing Company, 1995). ^ Peter Singer. "Animals" in The Oxford Companion to Philosophy. ^ Peter Kreeft, Summa of the Summa (San Francisco: Ignatius Press, 1990), pp. 74-77, 86-87, 97-99, 105, 111-112. ^ Aidan Nichols, Discovering Aquinas (Grand Rapids, Michigan: Eerdmans Publishing Company, 2002), pp. 173-174. 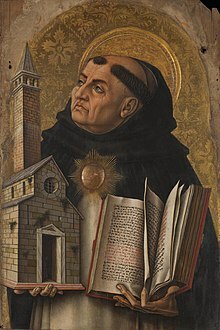 ^ Thomas Aquinas, Aquinas's Shorter Summa (Manchester, New Hampshire, New Hampshire: Sophia Institute Press, 2002), pp. 228-229. ^ Aquinas 2002, pp. 231-239. ^ Aquinas 2002, pp. 241, 245-249. Emphasis is the author's. ^ 列奥·施特劳斯，约瑟夫·克罗波西. 政治哲学史. 石家庄: 河北人民出版社. 1993: 278. ISBN 9787202014349. "Bibliography of Additional Readings" (1990). In Mortimer J. Adler (Ed. ), Great Books of the Western World, 2nd ed., v. 2, pp. 987-988. Chicago: Encyclopedia Britannica. Craig Paterson & Matthew S. Pugh (eds.) Analytical Thomism: Traditions in Dialogue. Ashgate, 2006.